A bank holiday always lifts the spirits and from everyone at LDC we truly hope you had a very "hoppy" Easter! British fashion retailer New Look has announced that they will be closing 60 stores as part of a rescue deal to avoid administration. The closures will take place over the next 12 months across the UK from Cardiff to London's Oxford Circus. They will however be making efforts to redeploy staff to elsewhere in the business. Although the high street is going through a tough stage, businesses are making challenging decisions to stay afloat. Genus UK Ltd, owners of Select have asked for advice on a Company Voluntary Agreement (CVA) similar to New Look, where creditors will make decisions on potential closures of their stores. The Gym Group are eyeing the soon-to-be empty properties left by UK retailers Toys 'R' Us and Maplin who have confirmed a plethora of closures. The Gym Group have already opened gyms in disused Sainsbury’s sites and BHS stores as they focus on the larger available units. The Gym Group currently have over 100 existing gyms in the UK and plan to open 20 sites in 2018. Lego has been voted the UK’s strongest brand in the annual UK Super Brands ranking! Lego, who were in 25th place back in 2014 and came second last year, have beat last year’s winner British Airways. It was shocking news for British Airways as they fell straight out of the top 20, a move which analysts say is a huge wake up call for the brand. Lego - who have recently celebrated their 60th anniversary, beat over 1,500 companies to take the title of Britain’s favourite brand for 2018. The list is determined by 2,500 consumers who are asked to rank the brand for quality, reliability and distinction. 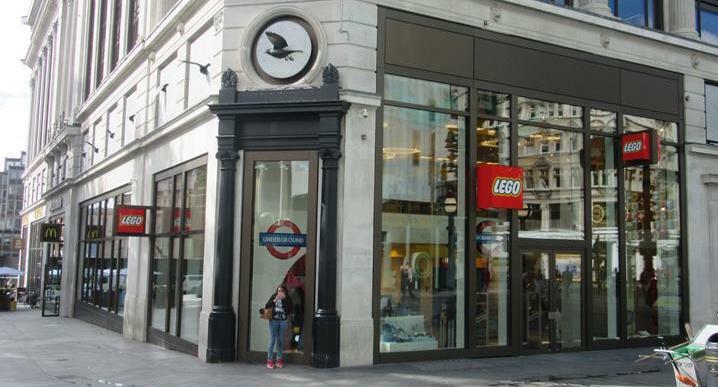 Lego Store, London (Source: LDC). JD Sports have leapt into the US market with their acquisition of US-based brand The Finish Line, who currently trade with 556 retail stores across 44 US states and Puerto Rico. The Finish Line is a footwear chain specialising in athletic shoes and have concessions inside Macy’s department stores stateside. Tesco and Morrisons were the fastest growing of the big four supermarkets in the 12 weeks to 25th February according to the latest figures from Kantar Worldpanel. Both supermarkets showed a sales growth of 2.7% with Tesco experiencing particularly strong growth from its Tesco Extra stores. However, Tesco is not the only one to celebrate. The grocery market appears to be in excellent health throughout with March marking the 12th consecutive period in a row that total market sales growth exceeded 3%. Each of the big four retailers saw positive growth. Another milestone came in March for Tesco, as it finally completed its £4bn takeover of Booker, meaning Tesco is now bigger than the total of rivals Sainsbury’s, Morrisons, Marks & Spencer and Ocado put together. The Co-op has trailed its new, ‘shop, scan and go’ technology at its Co-op store located in its Manchester support centre. The technology allows customers to scan products as they shop on their own device, then the total amount is taken from their account with a single click - all without visiting a till. If successful, a wider roll-out of the initiative could be seen in the summer. It is not the first new type of technology to be tested this year, with Amazon Go piloted in the US and customers using their smartphones in a similar way. New payment technology may rapidly increase in the next few years as retailers try to give the consumer more convenient choices, following a decrease in cash transactions. In the last 18 months The Co-op has seen a 15% decrease in cash transactions and on a more long term scale, the number has reduced by one fifth in the last five years. Prezzo, the British-owned pizza restaurant chain has had a rough start to 2018. They announced this month that they will close almost 100 branches as they work with creditors for Company Voluntary Arrangement (CVA), to close unprofitable branches. Some of the branches set to close are; Alton, Blackpool, Carlisle, Guilford, Newbury as well as all of their Chimichanga branded sites. Although hundreds of jobs will be affected, workers will be allocated to one of the company's other restaurants. However, Prezzo will still be left with 200+ sites that will operate as usual. The restaurant market is being tested due to the competitive market, sales being down in general and increase of rent/premise prices. Budget hotel operator Travelodge has announced that it will be opening 20 more hotels in 2018, including its biggest new build, The London City Travelodge. The 395-room hotel will open on Middlesex Street, close to the Gherkin. It has stated that much of its recent success has been driven by its growing appeal to business travellers. It will also continue with offering bars and cafés in 14 of the 20 new openings to compliment this clientele. Some of the hotels expected to open in 2018 are: London Acton, Dagenham, Glasgow, Solihull, Walsall and York. This stems from an announcement stating that the UK is back on top for European hotel transactions. Transaction volumes reached £4.8bn in 2017 beating Germany who secured second place with £2.1bn. The Eataly (Eat + Italy) food hall brand have confirmed that it will be debuting its first UK site in London Broadgate by 2020. The Eataly concept hosts Italian restaurants and food stalls that offer traditional Italian produce, coffee shops and small stalls offering hot food. They currently trade in various far-reaching locations such as Florence, Chicago, Boston, Istanbul and Moscow. The food hall will open in a 42,000 sq. ft. space at 135 Bishopsgate. This month, Westfield London opened its £600m extension six months early, transforming the destination into the largest shopping centre in Europe. It has now surpassed Aviapark in Moscow and the Westgate Shopping City in Zagreb, Croatia, with its overall size increasing to 2.6m sq. ft. The extension itself covers 740,000 sq. ft. and is opening in phases, with the new ultra-modern John Lewis already open and also features a mini amphitheatre, surrounded by restaurants. Amongst the new store openings are BoConcept, West Elm, The White Company, Bershka, Stradivarius and Pull & Bear. In a departure from its luxury brands, we will soon see a new 70,000 sq. ft. Primark, which is reportedly the second most requested store after John Lewis. Westfield London celebrates its 10th anniversary this October when the final phase of the development is set to launch. Global real estate adviser Colliers International has named Edinburgh as the UK’s top city ‘hot spot’ for hotel development. The UK Hotels Market Index consists of 34 locations across the UK to determine the UK’s top investment rankings. Edinburgh has taken the top spot, moving up four places in 2017 from the previous year. Key factors can be put down to: overseas hotel transactions and investments, a boom of inbound tourism, and a strong restaurant industry. 2017 revealed very promising performance as hotel investment transactions rose by 69% from 2016 exceeding £240m. VisitScotland statistics shows that the number of international tourist trips to Scotland increased by 14.6% in the first three quarters of 2017. This ranking is further confirmed by two main international airports in Scotland both declaring record passenger numbers.